Die Shop Equipment – Retractable Saws – AmeriKen Online! Top of the line, It’s built to withstand all the heavy duty work you can give it. It has a big 60 or 70 inch throat and is a true heavyweight: 1800 lbs. with a cast iron top and head assembly, foot operated jig unit and drill press. A whisper quiet, high capacity vacuum unit is standard. 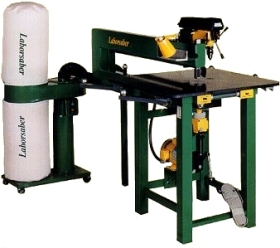 If you have a lot of demanding production work, this is the saw designed and built for you! 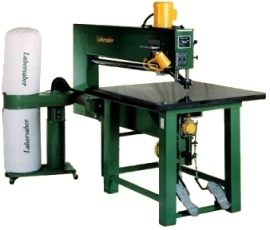 This is the saw built by customer demand. 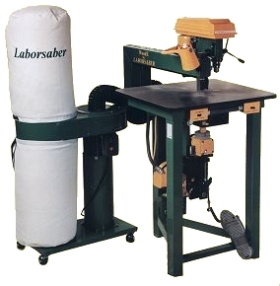 Valuable feedback from many shops asking for a Laborsaber built for smaller diemaking. Ideal for gasket making operations, offset and letterpress printing presses – anywhere smaller dies are needed. 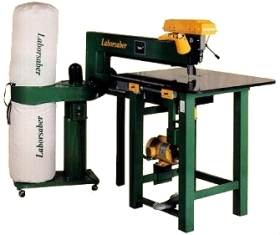 It has a taller arm design to accomodate our optional, patented tool for precision circle and radius cutting. The unique side arm design allows placement close to a wall in shops where space is at a premium.